Chocoball treats by Morinaga are well known for their funny commercials in Japan, and even more for their delicious taste! 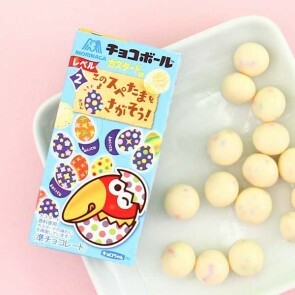 Kyuro-chan, the mascot bird, opens his beak in each package and reveals the creamy chocolate ball with a treat hidden inside! The limited edition fillings vary besides the classic fillings: peanuts, strawberries, and caramel!